ZAKARIA: Ratan Tata is the chairman of the Taj Group of hotels, and also the Tata Group -- the largest private corporate group in India. It has interests in steel, cars, communications, computer technology, power -- and, of course, hotels. Their revenues last year were $62.5 billion. 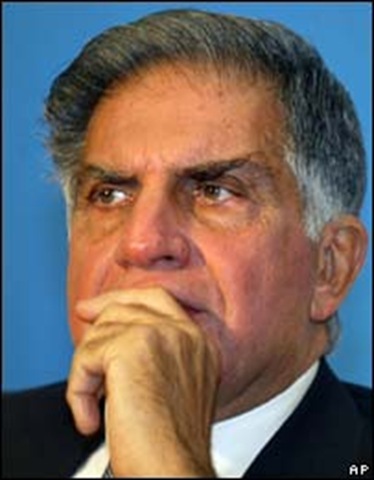 Ratan Tata is often described as India`s David Rockefeller. He joins me today to talk about how the attacks affect his hometown, the country and business in India. Tell me how you felt when you first heard about the attacks. RATAN TATA, CHAIRMAN, TATA GROUP AND OWNER, TAJ HOTEL: I`ve got to say that I was truly emotionally overcome when I saw this old, venerable, rather beautiful building going up in flames, and I kept hearing the grenades or explosives going on inside, the sound of gunfire, the fact that there were several hundred people in the hotel, either at dinner or living there. And I just felt tremendously helpless. We can only say that -- you know, I have to say, the heroes of that evening were members of the staffs, many of them who lost their lives. But people used their heads and saved so many, and sheltered so many of the guests who were there either for dinner or otherwise, and got them out. But we`ve had a horrible loss of life, a completely wanton destruction of property. And this morning, finally, after almost three days, we understand from the commandos that all of the militants are eliminated. ZAKARIA: You must have known personally some of the people who lost their lives. TATA: Yes, I did. And it was tragic, because some of the people had -- one in particular husband and wife were there to celebrate their anniversary. The husband made it, the wife didn`t. I knew several of the staff members -- not well, but obviously by first name -- and they were gone. Some of them were gone just in cold blood, I understand, just shot in the head or shot at point-blank range. Others were shot in a wanton, sort of random fire that took place. And all in all, it was just a horrible event that I never thought we would ever see in India, leave alone at the Taj. ZAKARIA: When you were on your cell phone, trying to deal with this situation, did you feel that the police was responsive? Did you feel as though you were getting the cooperation you needed? TATA: Well, you know, we were getting the cooperation that they could give us, but the infrastructure was woefully poor. Fires raged for almost three hours before we could get, on that first night, any fire engines who were there to respond with water. The police were woefully inadequate in terms of equipment and in terms of being prepared. And it was only after the army and the commandos came in -- and even they were, in relative terms, ill-equipped against these militants, who were very well trained, seemed to have a plan of action. And it has led me to believe that what the city really needs is a crisis management group that could step into action instantly when we have a situation like this, where there`s a plan of action, where they can deal with these kinds of crises instantly and well and professionally, and the people get equipped to do so. We had people who died being shot through bullet-proof vests. And all in all, they`ve been ill-equipped. ZAKARIA: It does appear from the outside -- many people are wondering why there weren`t more commandos there earlier, why they didn`t storm the hotel with hundreds of them to overwhelm them, why they didn`t use teargas. Are these questions being asked in India? TATA: Yes, they are. They`re being asked by us. We were told that their instructions were to minimize the collateral damage to the property. But that`s a question mark, because much of the property went up in flames and was allowed to flare -- for all of you who watched it on television have seen that happen. But I think, you know, something I want to say is that, rather than have us succumb to this kind of terror, what it has done is, I think, given us a resolve that nobody can do this to us. It has united us in the Taj. The staff has been fantastic. The spirit of the staff -- you know, we lost -- the general manager lost his whole family in one of the fires in the building. And I went up to him today, and I told him how sorry I was. And he said, "Sir, you know, we`re going to beat this. We`re going to build this Taj back into what it was. We`re standing with you. We will build this thing back. We will not let this event take us down." And that, I think, is the feeling that they have. And I have a feeling that that`s pretty much echoed throughout the country. We`re indignant, but we`re not scared. If there`s a view that has pulled us down, I think it`ll unite the country that much more. ZAKARIA: Do you worry that it will scare foreign investors, that they might be spooked in some way by this? TATA: Yes. I have no doubt that, certainly short term, that may happen. And if it does, it would be natural that it take place, because, if you talk to some of the people who have had to go through this experience, either in our hotel or the Oberoi or elsewhere, this doesn`t happen very often. And when it does, it spooks a lot of people, and rightly so. So, we will have to do something as a nation to be able to deal with this kind of terror, if it is now being addressed to us, or directed to us. We`ve been very complacent, because we`ve really not had this kind of terrorism inflicted upon us. And I think, as we look forward, we will have to put this into our equation of things we need to be prepared for. And crises infrastructure, I think is one that we will just have to address. And if we need to get expertise from outside, we should not stand on ceremony to hold back. We should go to the best place possible to get expertise, and have that installed with us in terms of hardware, in terms of training, in terms of strategy. ZAKARIA: Did you get this feeling that the terrorists seemed to know the hotel, and seemed to have plotted this very carefully in terms of the layout, where they moved? TATA: Yes. There seems to be no doubt that they knew their way around the hotel, that they seemed to know it in the night or in the daytime. They seemed to have planned their moves quite well. And there seemed to have been a lot of pre-planning in terms of what they did, and how they managed to carry on for three days and sustain themselves during that time. ZAKARIA: Could anyone have had some kind of inside connection? TATA: I wouldn`t know. I think this would be something that the investigation will show up. Certainly, they had a lot of planning that went into it. Whether it was themselves, whether it was assistance from inside, or whether it was just a very well planned, very well organized investigation of the property, I really don`t know. ZAKARIA: You had been warned that there was some danger of some kind of attack. You had elaborate security measures. And it appears that the terrorists waited until you relaxed them at the Taj Hotel, which again suggests some kind of either inside connection or very careful watching of the situation. TATA: Yes, you know, it`s ironic that we did have such a warning, and we did have some measures to, you know, where people couldn`t park their cars in the portico where you had to go through a metal detector. But if I look at what we had, which all of us complained about, it could not have stopped what took place. They didn`t come through that entrance. They came from somewhere in the back. They planned everything. I believe they -- the first thing they did was, they shot a sniffer dog and his handler. They went through the kitchen. They knew what they were doing, and they did not go through the front. All our arrangements were in the front. ZAKARIA: You`ve been back now and seen the hotel. What did it look like? TATA: It`s -- I`ve only been in the lobby and into the restaurant where the last shootout took place. And I went there this evening just before coming here. It`s a very, very sad and depressing sight. The lobby is relatively untouched, at least at first glance. The restaurant where the firefight took place is riddled with bullet marks, and the walls are scarred with grenade blasts. And it looks like it`s been hit by a bomb. And, you know, I have to say that the commandos that faced this were very courageous people. Those who lost their lives in this, I think really gave their lives for the job they had. And the reason I say that we got cooperation is that the commandos really did whatever they could, given what they had. And they paid a penalty for it in terms of loss of life of some of their leaders -- very good officers. And the staff also went far beyond the call of duty to serve the guests. So, on the whole, I would say that we really are very grateful for the people that did what they did. And the whole affair is just devastating, because it was so well planned and it did so much damage. It took such a loss of life. People were shot point-blank. They were -- they sprayed bullets from automatic weapons. They lobbed grenades. And they did this for three days. And that`s truly devastating. I understand the top floor of the hotel is gutted. But we`re all committed that we will build back this hotel to what it is. However long it takes, whatever it takes, this hotel will stand. I can only say that it somehow epitomizes the will of my great- grandfather, because it stood up to all the abuse it has. And we will have it in shape, hopefully, for another 100 years. ZAKARIA: And in broader terms, India`s economy and India`s business -- you`re also going through a global slowdown, a financial crisis, at least in the Western world. How will India handle this? Are you bullish about India`s prospects? TATA: Well, I think that India doesn`t suffer from the same cause of economic turndown that is plaguing the West at this time. And I believe that, with an adequate infusion of capital and credit into the Indian economy, which the government can easily do at reasonable rates, that we can invigorate, or reinvigorate, the economy on a domestic basis, so that we can go through this period of downturn without too much strain in India. But it will call for the government being bold in terms of what it puts back into the banks, and what it almost mandates the banks to do in terms of getting the credit to the consumer. ZAKARIA: But you see domestic demand as being strong enough to keep things going at a reasonable growth rate. TATA: Yes, I do. And mind you, we don`t have toxic paper. We don`t have subprime and mortgage problems. The issue is that money had been drawn out of the economy to combat inflation. And if we can live with a slightly higher inflation, it is my probably uneducated view that we can reinvigorate the economy. The global -- I mean, the domestic demand is quite strong. What is happening now is that there is no credit in the market, and whatever there is, is at very, very high interest rates. ZAKARIA: And if you had a message to the world, who have witnessed all this and seen your hotel -- the hotel that your great- grandfather built -- go up in flames, what would it be? TATA: I think my message would be that this has been a terrible blow to us, but we will, in fact, overcome the challenges that are ahead. It has not, in fact, diminished our commitment to go ahead with what we had in our minds, and that we will rebuild what has been damaged or destroyed, and that we will only come out stronger and, in fact, more determined than we were before this very unfortunate event took place. ZAKARIA: Mr. Tata, our condolences to all your staff. TATA: We will not be defeated.